Driving around the outer peninsula of Point Reyes National Seashore at this time of year is great for finding raptors. 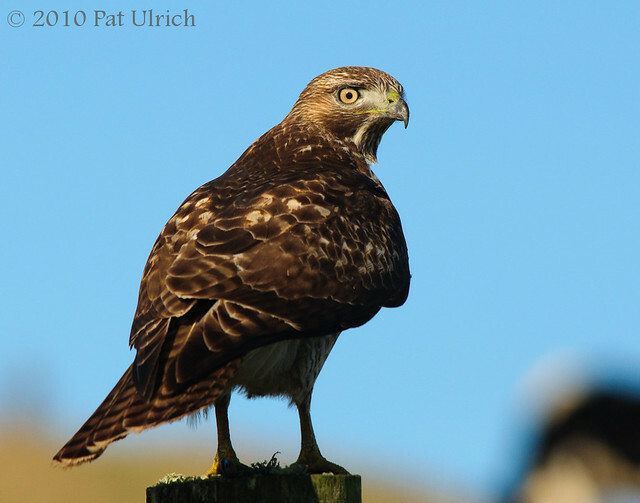 Its easy to spot a variety of birds perched along the fencing that runs along Sir Francis Drake Boulevard, as they scan the agricultural fields for a meal. I snapped off a few shots of this bird from the car while driving out towards the lighthouse area, and I saw it still there on my way back as well. I also saw what looked like a Cooper's hawk and a handful of kestrels, but they were opposed to having their picture taken. What a beauty ! And what an eye ! The eye perfectly in focus and the head is lit dramatically. I'm guessing, a 400mm lens? Wonderfully captured! Thanks, Pescalue! Their eyes really are something -- they just pull you right in. And to know how well they see with them makes it even more interesting. Thanks, pineriverreview! This was shot with my 200-500 zoom, and it certainly would have been out at the far end of that range.